It covers the port of the OpenCalais Integration and its Share UI extension to work with Apache Stanbol. These integrations support auto-tagging, semantic tag clouds, and semantic geo-tagged maps. Both integrations are open source and available on Google Code . To use the free OpenCalais service, you need to get an API key from opencalais.com This allows you to submit 50,000 documents a day. More requests are supported in the non free version called Calais vs. the free (but not open source) service called OpenCalais. Note that document size per submission is to 100k bytes in all versions, the service retains extracted metadata (doesn’t retain content). So its geared more for news articles than large sensitive documents. Calais has a test page to try out giving it text and seeing what it extracts. To use the Share auto-tag action menu (used to do a one time auto-tag on a document) you need a Calais api key setup in module\calais\module-context.xml (see readme.txt). Semantic tags will be listed in the properties section of a Share document details page (not with regular tag UI since a different category content model / custom root category is used for semantic tags). You can also add one or more semantic tag clouds dashlets and a semantic geo-tagged map dashlet to share dashboards (site and/or global) to navigate from semantic tags to documents. In explorer, doing a one time auto-tag you need to used the run a rule on a doc action and give the Calais key each time in the dialog. A rule to auto-tag documents in a folder can be setup in Explorer or Share (using the “Auto-tag with Calais” action, and you need to give the Calais api key as a parameter to this). FlexSpaces has support for the OpenCalais integration in all its versions (desktop AIR client, Flex in-browser, Mobile AIR). Like Share it supports semantic tag clouds, a semantic geo-tagged map, and one time auto-tagging like Share. It has additional OpenCalais features: semantic tag suggestion, adding / removing semantic tags on a document. You can setup a Calais api key (and Alfresco server info) in FlexSpaces preferences dialog that was added in the 2012.02.08 version and avoid having to do this in FlexSpacesConfig.xml . Info entered is sticky and per user on their local machine (stored in a Local Shared Object). So theoretically each user could submit 50,000 documents a day to OpenCalais if they each signed up for a key. FlexibleShare includes FlexSpaces and its semantic features, but hasn’t been updated with the preferences dialog or other recent FlexSpaces changes yet (update: FlexibleShare 6/28/2012 version now has the preferences dialog and Alfresco 4.0 support too). Plan to have an Alfresco integration with Apache Stanbol on the same Semantics4Alfresco Google Code site with the OpenCalais integration. Apache Stanbol (derived from the IKS project) is fully open source, is a general stack of frameworks for semantic content management and can do more than content enhancement, can get around the drawbacks of OpenCalais, and gives you more flexibility to setup customized ontologies vs. the fixed support Calias has. Stanbol can also call other enhancement engines instead of the default OpenNLP or even chain them together. Stanbol has an adapter for OpenCalais. For enhancing news, OpenCalais works better out of the box than OpenNLP. Zaizi has already done Stanbol integration work, although only a version for an old IKS version is currently open source. Integrated Semantics will leverage / extend any newer Stanbol integration that Zaizi makes available open source. A Stanbol integration could extend Solr facets with semantic facets. The dashlets will show semantic tags in all share sites when added to the overall Share dashboard, and show site specific semantic tags when added to site dashboards. Clicking on a tag in the semantic tag cloud or on a semantic tag map marker will take you to a search results list of documents with the semantic tag. The semantic tag cloud dashlet can be changed to show semantic tags for a specific category or all categories. The semantic tag cloud dashlet is based on Will Abson’s tag cloud dashlet in the Alfresco Share Extras collection. Will now also has a Google map dashlet in this collection showing geo-location of photo files using Tika extracted metadata available in Alfresco 3.4. The added auto-tag action menu (in more menu and details page) can be used to auto tag the selected document with the OpenCalais service. 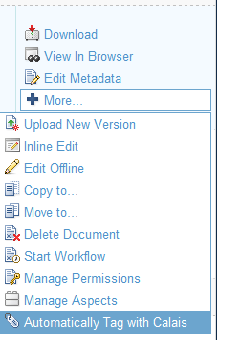 This action is added to both site document libraries and repository document library page menu.The auto-tagging action can also be setup in a content rule to auto-tag all documents in a folder in the rule UI of Alfresco Explorer or in Share (choose to perfom the action “Auto-tag with Calais”). Note that semantic tags are implemented with categories with a custom root category. They won’t show up in regular Alfresco tag or category UI. Currently only the Alfresco Explorer details page will list semantic tags (update 3/30/2011: will now show up the Share doc details page too in the 1.3.1 version of the OpenCalais integration). FlexSpaces, in addition to having the semantic tag clouds, semantic map, and auto-tag action features in the Share UI, also has support for suggesting semantic tags and for editing what semantic tags are assigned to a document. 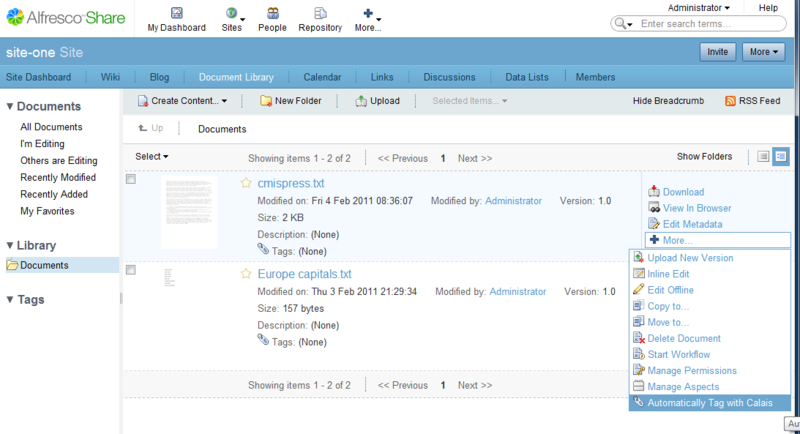 See the semantic features in action in this screen-cam of an older version of FlexSpaces. Here is a screencam video of FlexSpaces 0.8 (which is ready for release). This new screencam shows auto-tagging, semi-automatic tag suggesting, multiple semantic tag clouds, and automatic geo-location tagging (displayed on a Google map). 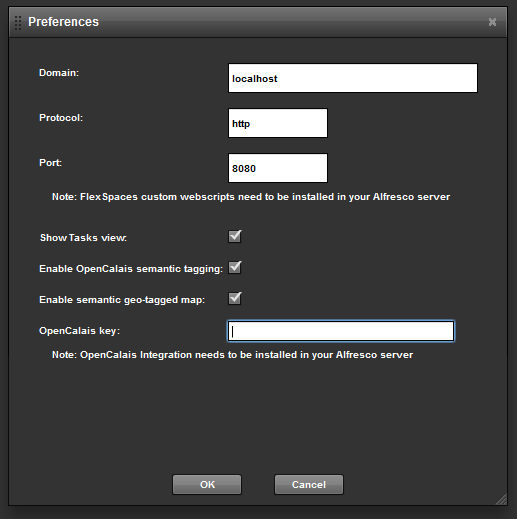 It uses the Calais Integration forge project for Alfresco and the Open Calais service. This map, uses the Google Map Flash API (Flex), displays markers where there is location info provided in the semantic tags (location info from Calais via the Calais integration). When you click on a marker, it works just like a tag cloud, and drives search results. (Note: the previous part 1 post also showed showed auto-tagging and multiple semantic tag clouds in FlexSpaces). FlexSpaces supports Alfresco Enterprise/Labs 2.x/3.x, Adobe LiveCycle Content Services ES (currently have just been testing FlexSpaces 0.8 and the semantic / Calais features with Alfresco Enterprise 3.0). FlexSpaces 0.8 will have the following new Flex based components (and Cairngorm non ui apis): node semantic tag properties editor, auto-tag action, tag suggestion dialog, semantic tag cloud, semantic tag category tree, general Google map, semantic geo-tag map. Here is a sneak peak video of semantic auto-tagging and multiple semantic tag clouds coming in the next release of FlexSpaces+AIR / FlexSpaces+Browser. This uses the Calais Integration Alexander and I have been working on, the Open Calais service, and Alfresco. The Calais integration auto-tag action can also be used from the “run action” UI in the Alfresco web client (now called Explorer). Things in the works: Flex UI for tag suggestions, storing URIs in the integration for future linked data use, storing geo-location info from Calais 3.1, and map UI to display geo-location points to filter search results. The Calais integration amps including web scripts are in the Calais Integration forge project. Note we may use the Semantics for Alfresco merged project for certain pieces in the future. A google code project, semantics4alfresco has also been reserved. Current FlexSpaces downloads are in the FlexSpaces forge project. Its svn is in the flexspaces google code project.